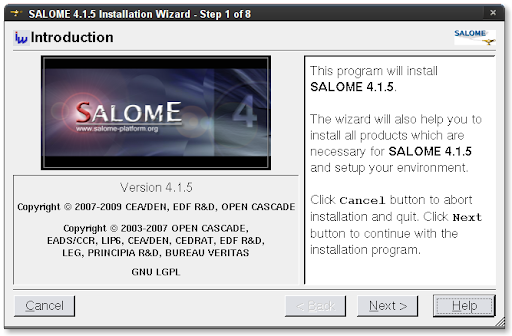 I was using SALOME 4.1.4 before. Not like SALOME 5.1.1, the GUI in 4.1.4 is written based on QT 3. If you found the appearance of this GUI is not elegant as you expect, maybe a method can be borrowed to polish it. Matter of fact, a tool named qt3-qtconfig can be used to adjust the QT 3 program appearance. The modification will be applied onto all QT 3 programs in the system. Use apt-get to install the tool. I suggest the theme "polymer" for QT 3. Use apt-get to install the theme. After they are installed, run "qtconfig-qt3" to apply the "polymer" theme. Actually, with the tool it is also possible to specify Font Family used for QT 3 programs. I prefer 'Bitstream Vera Sans' size 9. You can choose whatever you like. I have turned to SALOME 5.1.1 already. It is therefore a pity that I cannot take screenshots to show the effect. Please try to see if you are interested.